I had been in Ireland for two days with some friends after finishing finals during my semester abroad. I was going back to the U.S. in two weeks and this was my last hurrah. At the end of our two days in Ireland our group was splitting up with two going to Amsterdam and three of us to Nice. I was part of the trio and our flight was at 4 a.m. 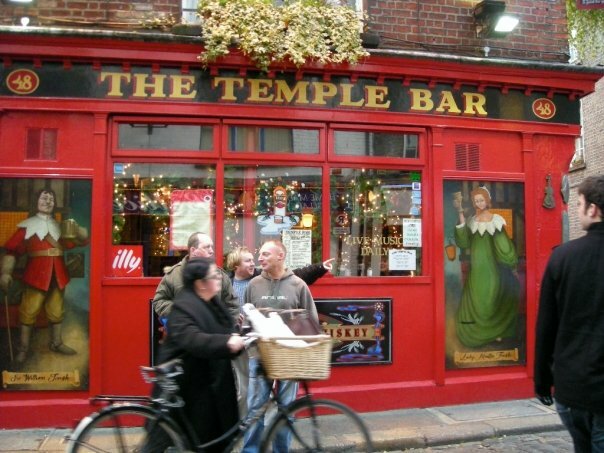 In a very irresponsible decision, rather than get some rest — we all decided to stay up throughout the night and make one last lap of the Irish pubs in the Temple District of Dublin. So, by the time we arrived at the airport we were all thoroughly dazed with exhaustion and copious amounts of Guinness and Irish whiskey. The idea of sleeping for the three hour flight to the south of France was a met with huge anticipation. We made it to our gate with little trouble and out of the corner of my eye I saw a tall boy ahead of us with close cropped reddish blonde hair and a thick black sweater talking to two girls. I blinked and looked again. The boy was so familiar. He looked just like an old friend from high school whom I hadn’t seen in four years. My two traveling companions asked me if something was wrong. I told them about the shock of familiarity and that there was a slight possibility it could be the same friend. We hadn’t spoken in quite some time but we were Facebook friends and I had noted that he was doing a study abroad program in France at the same time I was in the U.K. But, it was still so unlikely. My friends’ response to this was to start saying the guys name aloud (in true mature fashion) to see if he turned around in response. Nothing. This was obviously not the same person — just someone who looked a lot like him. There — now in full view of me was the same guy I had glimpsed earlier now staring at me in surprise. I had been right. It had been the same friend I hadn’t seen since I was 16 from a small town in Washington state. Now, here we both were 20-years-old and meeting on an empty RyanAir flight from Dublin to the south of France at 4 a.m. Coincidentally, he had seen me earlier as well and wasn’t sure if it was me. Only when I was fumbling around for my boarding pass (at a total loss) was he certain that it could only be me. I would not get the much needed sleep that I was hoping for. My friend as it turned out had no time to spare when he got back to France as he had finals. We spent the whole three hours of the flight catching up (while my travel companions luckily got sleep). Hours later after bidding farewell to my friend at the airport and continuing onto Nice; I would literally begin to fall asleep mid-stride as I was walking the streets near the Mediterranean. It is still the most exhausted I have ever been to date. In life and especially in travel — there are so many moments we get to experience. These gems that you never would have found had you stayed in one place. One such moment is that very isolated time of being on a plane in-transit on the other side of the world and talking to someone you hadn’t seen in years. That moment gave me a real sense of how small the world really is. The first time I had a Guinness was on a hot summer day in the U.S. and it was horrible! I imagined it was what cold metal with some barley thrown in must have tasted like. I wouldn’t drink Guinness again until I moved to England in 2007, where I would find it to be a completely different beer all together. It was crisper and less bitter, with an almost refreshing finish to it. Guinness in England was delicious! I soon began to appreciate a good pint of the stout when I would go to the local pub. Why did Guinness suddenly taste better? Two reasons — Guinness must be poured a specific way (something that certainly wasn’t done in my first experience with it) and the closer you are to Dublin, the better the Guinness. I discovered how true this was when I had my first Guinness in Dublin. Pouring Guinness in Ireland is an art form and the standards on how to serve it are exceedingly high. 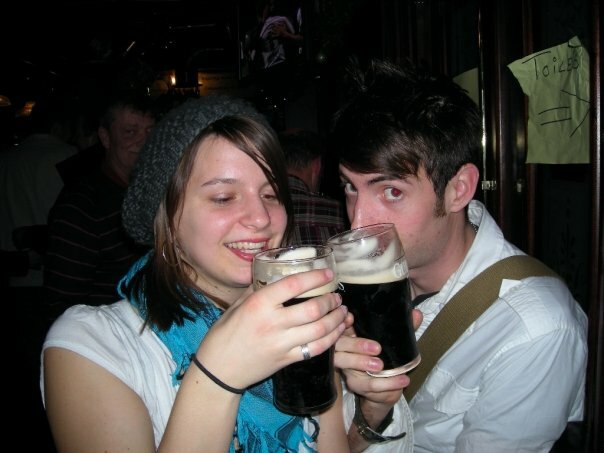 Therefore when I finally got my first taste of Guinness in Dublin, the result led to my and friends and I proclaiming “Guinness is gold!” But, our journey for the best pint of Guinness wouldn’t end with just any pub in Dublin. For that, we would have to go to the source. 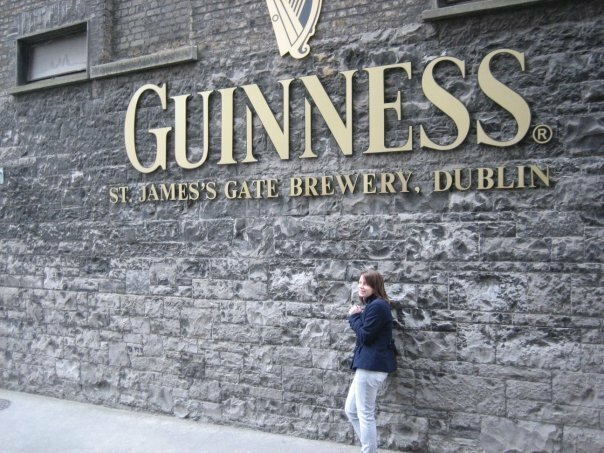 The St. James Gate brewery in Dublin is the home of the original Guinness factory opened by Arthur Guinness in 1759 and the current location of the Guinness Storehouse. There are usually long lines to get in, but the wait is worth it. The Storehouse is essentially an adult’s version of Willy Wonka’s Chocolate Factory, complete with waterfall. Here you get to learn about the history of Guinness, how it’s made, as well as the opportunity to start a batch of the black stuff. The Gravity Bar is at the top of the Storehouse and is where visitors can enjoy a perfectly poured pint as well as the amazing 360 degree view of Dublin. Once you have left the Storehouse, the Guinness experience doesn’t end. Guinness flows like water all over the city and there is nothing more Irish than to enjoy a Guinness in the atmosphere of a pub in the Temple Bar district. The Temple Bar district is near the River Liffey and is named after the Temple Bar (still in existence today) and has been around since 1637. The area is made up of numerous pubs along cobblestone streets. 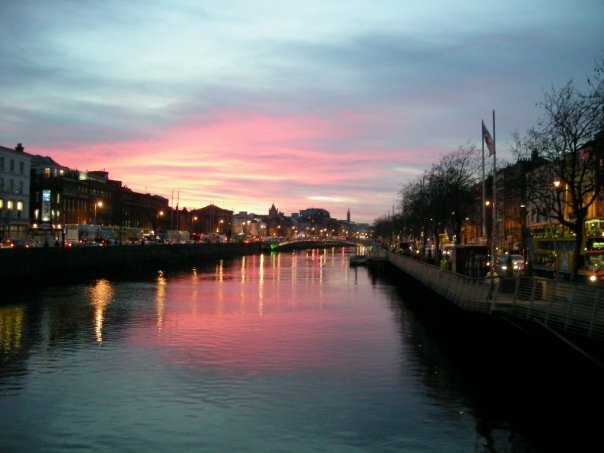 It is an ideal place to spend the evening in Dublin. The ultimate experience for me was popping into a few Irish pubs where a live folk band was playing Irish ballads and drinking a pint of the black stuff while chatting with the other pub goers. So, whether you are a jilted beer drinker who didn’t enjoy Guinness the first time around or a seasoned Guinness drinker — I implore you to try another glass the next time you are in Dublin! What’s the best pub you have been to in Dublin?